SHARK TEAM ONE Expedition Adoptions! Each time we go out on expedition to see the amazing animals we work to save, we can't help but miss them the moment we come back home. Now you can symbolically adopt a number of these animals and with your adoption comes an adorable plush toy with a Shark Team one mini bandana! You will love the hand-selected collection we have put together. The best part is, your adoption helps save the real thing! Whether you have come with us on an expedition before and want to commemorate your trip or just want one of these amazingly adorable animals, we can't thank you enough for your support! Be an endangered species HERO and adopt today! Fins UP! *The Shark Team One official mini bandana ties around your plush animal to show your support for endangered animals and Shark Team One! Be part of the TEAM and thank you for helping us save endangered animals! ** If you do not receive a confirmation email from us within a few days after you place your order please contact us ASAP at: info@sharkteamone.com or Call # 1-954-789-0762. Whale Shark - Adopt "Rooster"
Cownose Ray - Adopt "Contoy"
Giant Oceanic Manta Ray - Adopt "Azure"
Great Hammerhead - Adopt "Electro"
Great hammerhead sharks are amazing creatures with highly developed senses. They can turn on a dime and find their favorite stingray food beneath the sand without even seeing it, since these sharks can sense the electromagnetic pulses of their prey! So meet "Electro" our overstuffed expedition great hammerhead! Our great hammerhead conservation expeditions to the Bahamas create awareness for great hammerheads, since these animals are highly endangered. This cute, fluffy and fun-loving caricature of a great hammerhead is so fun! He will sit on your desk to keep you company and give you a chuckle every time you look at him. ​Great hammerheads are some of our favorite sharks. Our conservation initiatives for this endangered creature are far reaching since great hammerhead fins are highly sought after in the illegal wildlife trade market, so we are working to ban this practice. Our citizen science expeditions also benefit this beautiful and intelligent creature, as well as create ecotourism for small islands in the Bahamas. Electro sits 9" high and is too cute for words! He also comes with an official Shark Team One logo mini bandana! West Indian Manatee - Adopt "Crystal & baby Pete"
​"Crystal" is named for Crystal River, Florida where manatees go to gather in the winter months in Florida to stay toasty warm in the springs areas. Pete is Crystal's little baby in this adorable manatee baby and mother stuffed rendition of the real thing. Did you know that manatee calves nurse up by their mother's front flipper? Cool right? For a few weeks out of the winter we head up to Crystal River, Florida to swim with and create photojournalism outreach for this adorable and endangered mammal. We go to a super secret area called Three Sisters Spring which is tucked away from the world and is a magical, clear, blue springs location where we see manatees sometimes nursing just like baby Pete. We also work on manatee conservation policy and we even created a manatee conservation video in partnership with Wyland. So when you adopt Crystal and Pete you will be helping us with our work to help save endangered manatees in Florida! ​Crystal is 12" long and baby Pete is 5" long. They are permanently attached together in this adorable plush animal scene. Tiger Shark - Adopt "Hook"
Hook is a well-known "Tiger Beach" tiger shark and the star of our award-winning short film, Tiger Sharks Fight for Survival! Hook had her jaw broken by fishermen, but still lived to tell about it! This plush tiger shark's jaw is just fine and she is perfect for snuggling! She also looks awesome in our included official Shark Team One mini bandana! Real tiger sharks have beautiful tiger-like markings to help with their camouflage and this plush version has awesome stripes as well. 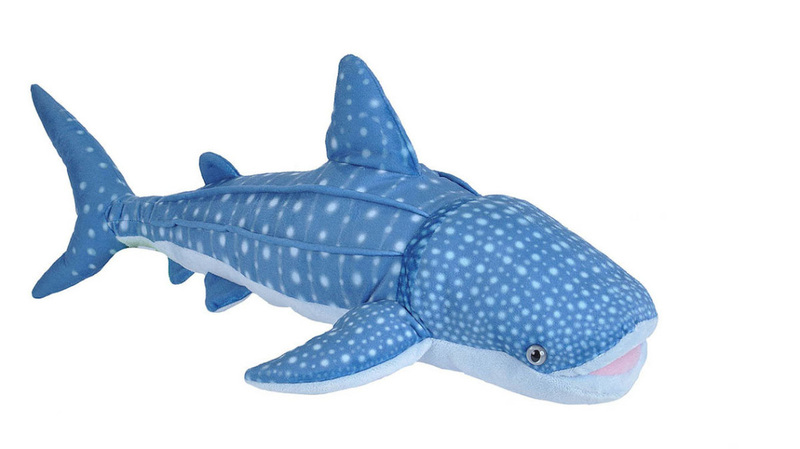 This tiger shark plush is a full 15" long so there is a lot of her to love! When you adopt Hook you will be supporting our expeditions to the Bahamas that create awareness for tiger shark conservation as well as our marine protected area work. We are currently fighting for tiger shark conservation off the coast of the United States since they are heavily overfished there and could be getting near the brink of extinction. Great White Shark - Adopt "Baja"
We are so happy to present this adorable little great white shark! One of our first conservation expeditions took us out to study and photograph great white sharks, so they hold a special place in our hearts! Big, toothy and intelligent...real great white sharks are in charge of their realm. We hope this adorable great white shark caricature brings you as much joy as we have saving their real big brothers and sisters. This little shark is 8" long and perfect for young cuddlers or adults looking for a jawsome way to remember their favorite and one of the world's most charismatic sharks, the great white! Support our work abroad and in the field by adopting "Baja". Baja could be one of the Guadalupe Island sharks who makes many special appearances on expeditions off the Western coast of Mexico. Know that by adopting Baja you are helping to save the remaining great white sharks of the world! ​Baja also comes with an official Shark Team One logo mini bandana! Sperm Whale - Adopt "Calypso"
Meet "Calypso"! With a name reminiscent of the romantic Caribbean, Calypso's adoption will help support our upcoming research and outreach expeditions to the island of Dominica where we study sperm whale individuals and their behavior. ​Calypso is 17" long, playful, majestic and super smart just like his big brothers, the real sperm whales who congregate off the island of Dominica. Check out his "spout" made of fluff! Super cute! Your adoption of Calypso will also help us support ecotourism on the hard hit island of Dominica by recent hurricane Maria. Our outreach and research projects with sperm whales include work for high schools, universities as well as endangered species behavioral research. Our individual whale photo ID work on these expeditions also supports the ongoing Dominica Sperm Whale Project. ​Calypso also comes with an official Shark Team One logo mini bandana! *Our official Shark Team One mini bandana is included with a number of the animal adoptions. Approximate bandana size depends on the size of each animal. The bandana ties around the animal's neck and is removable. See each adoption description for size of animal. Check the description to see which animals currently come with bandanas. Whale Shark, Manta Ray, Cownose Ray, Great Hammerhead, West Indian Manatee, Sperm Whale and Tiger Shark adoptions provide a $20.00 cash donation to Shark Team One after cost of plush animal, packaging and shipping. Great White Shark adoption provides a $10.00 cash donation to Shark Team One after cost of plush animal, packaging and shipping. Proceeds from Shark Team One Expedition Adoptions will be used for our Research Expeditions Program. All or part of your gift may be tax deductible as a charitable contribution. Please check with your tax advisor. The U.S.A. company we source these adorable animals from are endorsed by some very prestigious conservation organizations including Audubon, National Geographic, and the Natural History Museum. Striving to be both environmentally and ethically responsible, the source company is committed to exceeding industry safety standards as well as converting production processes to include eco-friendly practices like using sustainable resources and reusable packaging. Their ultimate goal is to provide stuffed animals and toys that educate and inspire children to develop a passion for preserving and protecting nature. Social sustainability and environmentally sustainable practices are monitored for components of certain animals pieces that are sewn at small companies in India with other animal components sewn in the U.S.A. We are proud to support both the parent company in the U.S.A. and the small sustainable company in India giving jobs to people in that region. We are a global organization and support global industries, not just U.S.A. companies. We're proud of our choices and hope one of our adorable plushes swims its way into your home today!